There's nothing I can say in the sub-headline to make this any less absurd. The year is 2017. President Donald J. Trump has been in the position of the United States presidency- one of the most prominent government positions on the planet- for about a year and a half now. Some time in the morning of Sunday, July 2, 2017, Trump has made a meme tweet on Twitter featuring him from a fake wrestling WWE skit violently attacking a man with CNN's logo shopped over his face. Some people on the Internet say that this is ridiculous but nothing really happens and Trump continues to lead one of the most powerful nations on Earth. But it's not a joke, which is the problem. Comedians are creative, but they aren't that creative. What was just described actually happened this morning, and it's bizarre. It's honestly surreal, and it would be hilarious if it wasn't so dangerous. But it is dangerous, because essentially what we have is a leader with zero self control and no idea how to publicly articulate his views telling the public that paying attention to the news is bad for them. 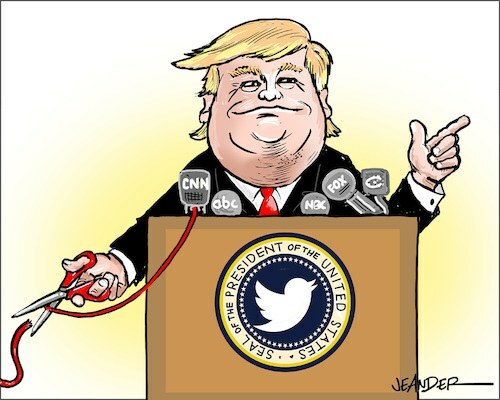 That in itself doesn't make Donald Trump a dictator, but it does demonstrate behavior that is generally indicative of someone who wants all the power he can get with none of the responsibility of being held accountable by the media or the public that it is meant to serve. Red flags should be going up. It honestly boggles my mind that a generally successful president, Bill Clinton, was forced out of office for cheating on his wife, yet our current commander in chief has not only admitted to doing that regularly on the record, but also lacks the capacity for basic public relations and is allowed to continue his childish tirade over and over again. This is not a partisan issue. Even Trump's own advisors have repeatedly told the man to stop making a fool of himself on social media, but he won't listen. He doesn't treat his advisors as legitimate factors in decision-making. He either uses them to reinforce his own views, or he ignores them, and that is a problem that cannot be dismissed as trivial any longer. Hopefully action is taken against Trump so that this cannot continue. Whether or not it will be is yet to be seen, but regardless, it is clear that going forward, some legislation is going to need to be put into place as a check on government officials and their behavior on the Internet, at the very least. The position of president is not meant to be a joke, and it needs to stop being treated like one.